Elska á Fjárfelli of the Dominion of Myrkfaelinn shares with us one of her entries into the Ice Dragon Pentathalon. As seen at the Ice Dragon Pentathlon this weekend. 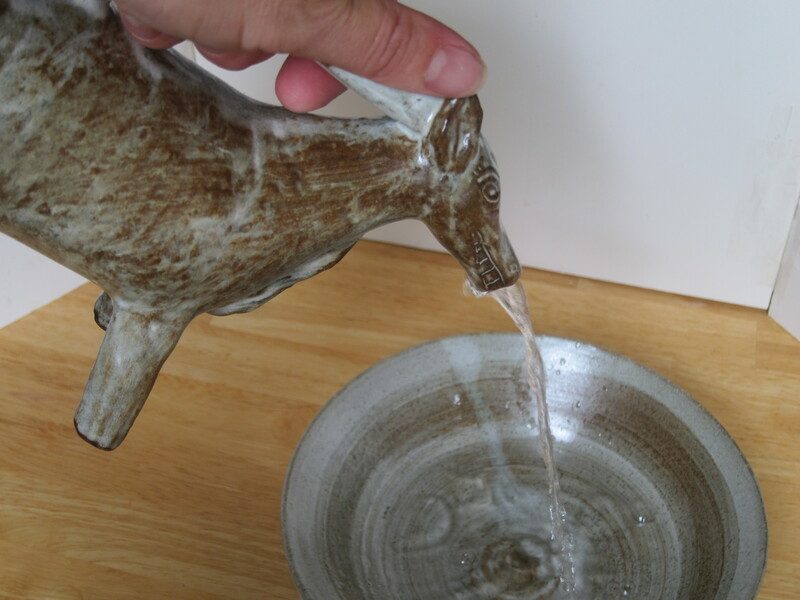 As part of my research into medieval soap I stumbled onto the ritual of hand washing at the table, and the use of whimsical pitchers to pour the water to do so. As black soap is not all that visually exciting, a beautiful medieval aquamanile reproduction would be the perfect eye candy for my A&S displays. Except all the ones I found available were in Europe, and as shipping is worrisome and prohibitively expensive, I took the plunge and decided to build my own. An aquamanile, from the Latin words for water (aqua) and hand (manus), is an animal- or human-shaped vessel used for washing the hands. 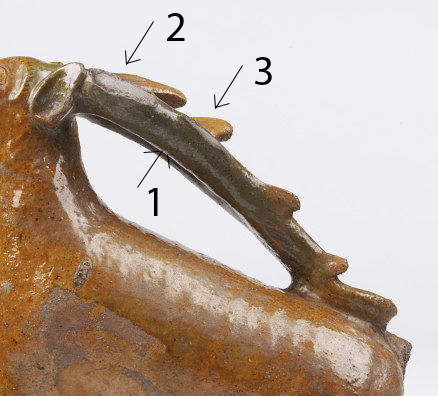 Medieval European examples date from the 12th C through the 15th C and, apart from curious shapes, have two water openings, one for pouring and one for filling, and a handle. According to one source, the name aquamanile for the vessel was not invented until the 19th C.; the medieval name for the aquamanile was lavoratorium, and the bowl receiving the water was the manilia. But as most resources including the MET designate these vessels as aquamanile, I will do the same. It for to void, when done have thy parents. Folding it up, at the higher end begin. The towel wanting, the cloth take instead. In place convenient, their pleasure abiding. In pouring out water more than will suffice. The aquamanile from Castle Hoensbroek which was found in the castle moat. 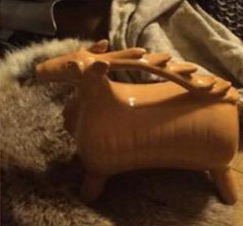 The figure probably represents a ram. This aquamanile is dated to the mid 14th century and decorated with green-tin glaze. The hundreds of surviving examples show the popularity of aquamanilia during the Middle Ages. The aquamanile was a sculptural vessel, often cast in copper alloy using the lost-wax method, and made in many forms such as lions, griffins, horses, unicorns, stags, dragons and even men. Aquamanilia were important items for religious hand washing rituals, but were also a luxurious show piece at a Lord’s table. For a more humble clientele pottery aquamanilia were available, evident by their mention in two inventories of medieval citizens in the city of Deventer, the Netherlands. Regular sets of ewers and bowls are found in many inventories, but the aquamanile surely is the pinnacle of medieval hand washing equipment. Animal shaped aquamanilia were not a new idea. 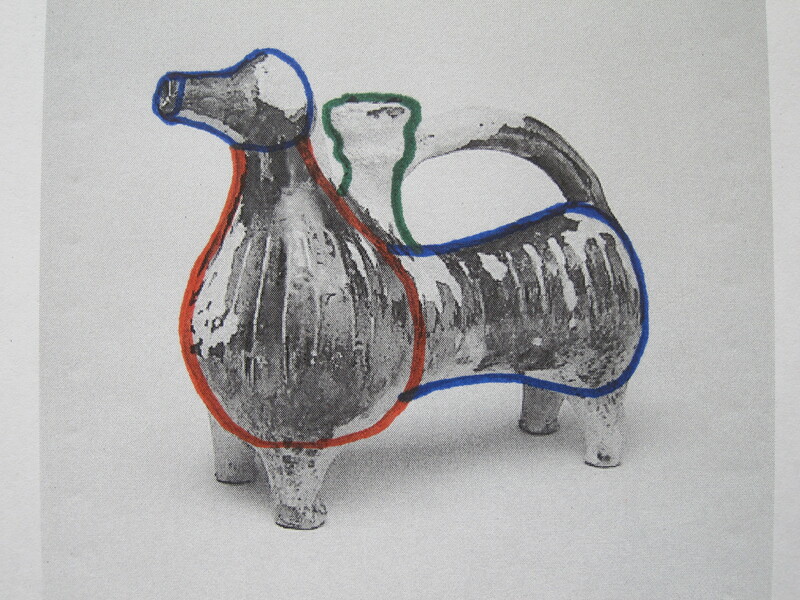 Late Roman, early Byzantine, and Islamic cultures had a vibrant tradition of hollow-cast vessels in animal form. Although late Roman and early Byzantine examples were made to contain oil rather than water, they could be seen as precursors of medieval aquamanila in how they were made, as well as in the use of animal forms. Islamic aquamanilia could have been among the luxury items brought to the West through diplomatic gift exchange, trading routes, or even as booty from the Crusades. Western European metalworkers, proficient in the casting of solid objects, relearned a set of skills that had been lost in the West since antiquity when adapting the designs of Islamic hollow-cast vessels to create aquamanilia. Example of a copper alloy Dragon aquamanile from The Metropolitan Museum, which has one of the largest and most important collections of aquamanilia in the world. This dragon aquamanile is supported by its legs in front and on the tips of its wings behind, and has a tail that curls up into a handle. It was filled through an opening in the tail, now missing its hinged cover. Water was poured out through the spout formed by the hooded or cowled figure held between the dragon’s teeth. In addition to its visual power, this aquamanile is distinguished by fine casting, visible in the carefully chased dragon’s scales and other surface details. Sometimes guests were formally conducted to an adjoining lavatory accompanied by the music of a minstrel, but ordinarily they remained in the hall and received from the ewer the warm water; often perfumed with rose-leaves, thyme lavender, sage, chamomile, marjoram or orange peel, one or all. The water and the towels were, of course, presented in the order of social standing of the guest, and it was esteemed a signal honor thus to serve a king or a great noble. In accord with the dignity of the ceremony the water jug and the basin in great houses were often of gold or silver curiously wrought and enameled. Water scented with sage: home grown and dried sage leaves, boiled with rain water. Sage helps in keeping skin healthy, including skin inflammations like eczema. Water scented with Rosemary and Orange: personally harvested rosemary (from the Carolina’s, where it is grown as an ornamental) and dried orange peels, boiled with rain water. The acids in orange peels act as a natural degreaser. Rosemary (family of sage) helps in keeping skin healthy and has an antibacterial effect. Years ago I played in a university ceramics studio, but hand building sculptures was never really my thing. For the past few years I’ve stored a small kick wheel but had no kiln. After a friend of mine offered to bisque and glaze our projects my kid and I played around for a winter or two, with the idea to reclaim clay from our property and throw small Viking type cups, bowls & vessels. Trying to build an aquamanile is lightyears beyond that, and not a minor decision, so in the hope one would work I started work on three different shapes. I wanted to do this one as it was found in the Netherlands. But for the life of me I could not throw a pitcher to then narrow the waist without collapsing the clay, so this design bit the dust in the throwing stage. The bump on the rear of this ram seems to indicate it was thrown as one shape, with that being the plugged neck. Found in Rye, UK and dated to the 14th C. It is 24 cm high and 35.5 cm long and made from red earthenware with lead glaze. The body is tubular, the antlers lie back to form the handle, and the hind legs are missing. The body seems to be made from a large tubular vessel with a smaller vase chest and a bud vase head. This aquamanile is assumed to be from Scarborough, England and made between 1250 to 1350 CE. It is made from earthenware with green glaze and measures 23.9 cm by 29.2 cm by 13.3 cm. It seems to be made from two larger jars, with a small bud vase as the head and a separately thrown neck as the water intake. It likely is missing its horns, from the absence of glaze on the sides of the head. Bisque: The first stage of heating clay. Bisque dry means the object is ready to be bisqued. A clay object first is bisqued heated so it is hard, then glaze is added and it is heated again to melt the glaze. So each glazed piece is heated twice, once to harden, and once to glaze. Leather Hard: letting clay dry for a while (often overnight) to partially dry out to a stage where it will be sturdy enough to withstand adding things onto it, like handles, legs etc. Kiln: the oven clay is fired or heated in (I borrow the use of a friend’s kiln). Slip: very watered down clay which can be used as glue. Score, scoring: drawing lines into the clay with a sharp object to increase the surface of where two pieces of clay will be attached. Slip is added to cover the inscribed lines to soften the clay for maximal stickiness and thus adherence. Wheel: the apparatus clay is thrown on. A heavy weight is kicked around an axle with a small tray at the top, the heavy weight keeps the small tray turning with just enough time between kicks to throw shapes out of clay. I use a mechanical kick wheel which looks like and works very similar to the kick wheels used in medieval times. Throw two pieces on a wheel; a larger tubular vase and a smaller bud vase. Wrap loosely in plastic and let dry to leather hard overnight. Line up the bud vase with the edge of the main body, and inscribe and then cut out the inside piece. Score and cover with slip (diluted clay that serves as glue), press well together, and sculpt into one piece. Carefully roll legs, measure into similar lengths, and attach to main body with the score and glue method. I also added a small roll of clay around the base of the leg for extra strength (plus it matches the flared silhouette of the original legs). I was careful not to trap any pockets of air anywhere as those can cause explosions when fired. When the legs are attached, wrap loosely in plastic (in medieval times it would be wrapped in damp cloth) and rest overnight. The original only has the front legs, the back ones probably broke off from the weight of shifting dirt while being buried. When the legs are nice and firm and support the body well, I started working on the head. I did not throw the head as it is relatively small; instead I made a pinch pot in the right shape. Remove the part that is at the neck opening, and use the score and glue method to secure everything together. I rolled two antlers of similar size and the right length and sculpted them to the back of the head. I used a piece of semi dry clay to help keep the wet clay from sagging. I used the score & glue method to stick the two antlers together, it would also be plausible to make one flat antler and carve it into two separate staves. I then cut a hole in the rear and worked the ends of the antlers around it to disguise the edge. Then I glued on and sculpted the small horns on the antlers, and finished the rear water intake. From the museum photograph it is hard to see for sure where the water intake should be, and after careful consideration of the design I decided this would be the most likely place. As shown in the original, I then added ears, chest flap, a mouth and eyes with eyebrows. When carefully dried, the aquamanilia are bisque fired. Clay is fired twice, once to harden and another time at a higher temperature to melt the glaze. After bisqueing the aquamanilia were dipped in glaze (looks like watery mud). As I have to use the same glazes as the owner of the kiln (so we can share firing without having chemical or temperature issues) and she does not use green (her glaze supply company also does not have green) or clear, I could not glaze the ram green or the stag orange like the original. I chose dark blue and white as it seemed to be the most appropriate for medieval ware. My interpretation bisqued and glazed. I used iron oxide under a white glaze. The original, as photographed by the Victoria & Albert Museum, London. The extant piece as photographed by the MET. I went to see the Medieval collection at the Cloisters of the Metropolitan Museum this past Christmas and to my happy surprise found this aquamanile on display. It was very rewarding to see it “live” after having worked so hard to emulate its shapes. As I only had one view to work from, it was wonderful to photograph it from all sides and was happy to find my interpretation is pretty close. Except for size, it’s huge at about twice as big! Reconstructing from museum photographs is not straight-forward, especially in this case as the stag is photographed in profile. As no detail is shown from a top view, reconstruction of the handle requires a bit of guesswork and a lot of careful scrutiny of the original image. In this case: as aquamanilia are expected to have two water holes, a small spout and a larger intake, where would the intake be? Is the handle made of one antler with one row of points, as it would seem from the single row visible, or two? Interpretation found on the internet. Single antler and no water in-take hole. Original from the British Museum. About the antlers: I think there are two staves with two rows of points. There is a slight highlight  on the bottom of the front antler with a darker line behind it and I think that darker line is the bottom of the back antler, indicating there are two staves. There is one row of antler points visible. I think that is coincidence: the top two happen to have been broken off at some point and the lower ones happen to be hiding behind the front antler (like they are in the photograph of my reproduction). Two oval break points are visible at  and , the right shape for a point and most telling: missing the glaze. About the water intake: Aquamanilia are supposed to have both a spout and a water in-take, but where is it here? The only place that makes sense would be at the bottom of the antlers, hiding in between. Therefore I interpret the bump at  to be the top rim of the water intake, hiding behind the two horizontal last antler points , one on each side (another reason to need two antler staves). From the very similar profiles on my version and the original version I am fairly confident this interpretation makes the most sense. Mine seems to be bit chunkier as the original as I am not proficient at throwing thin, plus I worried too small of a footprint for the bottom antlers, which doubles as a handle, would break too easily. The finished interpretation; top view. Ready for first use, with the matching bowl. Amman, Jost (1568) Panoplia omnium lliberalium mechanicarum (Book of Trades); Der Haffner (The Potter), one of 133 woodcut book illustrations. Frankfurt: Sigmund Feierabend. The British Museum. Greco, Gina L. & Rose, Chrisine M. (ed.) The Good Wife’s Guide (Le Ménagier de Paris, 1393). Ithaca: Cornell University Press, 2009. Plat, Sir Hugh (1609) Delightes for Ladies. London: printed by Peter Short. St. Thomas Guild: Medieval Table Manners; the aquamanile from Castle Hoensbroek. Waterdene, Chrestienne de: Facebook post Stag Aquamanile.